Rock the Cradle of Civilization | SPACE-BIFF! Sometime in the 23rd or 24th century BCE, things weren’t looking great for the Sumerians. Over hundreds of years they’d built multiple city-states along the alluvial plains of the violently unpredictable Tigris and Euphrates rivers, formed a powerful religion with priest-kings and mudbrick temples as their bases of authority, and even had time left over to develop writing somewhere along the way. Then an usurper came along, conquered most of the city-states, took a name that literally translates as, “No guys, really, I’m a totally legitimate king, I promise,” and set up the Akkad Dynasty. It would last for about a century and a half before more usurpers, more invaders, more uprisings continued to transform the face of Mesopotamia. It makes for gripping history, and it’s exactly what you’ll be doing in Reiner Knizia’s Tigris & Euphrates. The first settlers of the Fertile Crescent. At first it might not seem like Tigris & Euphrates is really about following in the footsteps of Sargon the Great. Tile-laying? Colorful plastic pieces for leaders? Is this really supposed to be a civilization game? Where’s the blood, the tears, the cards with italicized flavor text at the bottom? Before playing it, I’d even heard that for-some-reason dreaded adjective uttered in hushed, dismissive tones: abstract. First up is the tile-laying, everything revolving around those four colors of leaders, tiles, and victory points, each of which brings their own particular strength to the table. The most immediately useful of these are the red tiles, representing the religious side of life. Without the nod of those who commune with the gods, hopeful leaders would lose their support and heads right quick; hence, red tiles are useful because next to them are the only spots that leaders can be placed. And if you want to usurp a leader, you’re going to have to send your own leader into hostile territory and do better at manipulating the priesthood. But more on that later. The other colors are similarly defined. Blue is farmland, the only tile placed on river spaces. And because the most straightforward way to earn a victory point is by placing a certain color of tile into a kingdom where you have that same color of leader, black is useful because its leaders represent powerful kings, able to scoop up any color of victory point that would otherwise go unclaimed. Green is the color of economy, its leaders looting treasure tokens as kingdoms slowly grow together. Same game, same settlements, a short few centuries later. Here’s where the true brilliance of Tigris & Euphrates shines through: victory inevitably goes to the player with the highest lowest score. Which might sound like nonsense, but what it means is that everyone spends their time gathering four colors of points, struggling to keep their leaders in strong positions in order to rake in the goods, and whichever point they have the least of becomes their final score. A steady dynasty, then, must not only provide food year after year, but also religious stability, thriving settlements, and packed markets. Those treasure tokens, hotly contested and none too easy to pick up, are the game’s wilds, usable in place of anything and the perfect way to shore up a weak score. The race to claim them has led to many a civilization’s downfall. Not content to simply express the growth of civilizations, T&E goes through a sort of three-act structure that mimics the rise and decline of ancient societies. There’s the period in which city-states are far-flung, isolated, leaders dotting the map and taking advantage of freshly-laid tiles, but nobody in clear dominance. Then little by little, over centuries, these states consolidate, merging together into sprawling kingdoms. Treasures are claimed and maybe some monuments are built, big structures that loom over the map whenever a grid of same-color tiles are laid. Most importantly, these provide a steady drip of free victory points to whomever has matched their leaders to the monument’s colors. Unsurprisingly, this is the era when revolts become a real possibility as would-be usurpers arise in wealthy kingdoms. A word on these revolts. See, your dynasty’s leaders are free to share a kingdom with an opponent’s leaders. Any given kingdom never really belongs to one player. However, there can only be one color of a particular leader in any given kingdom at a time, a single high priest, market master, farm-boss, or king. When a kingdom becomes profitable, especially when a monument is built there, it often becomes expedient to oust the incumbent by placing your own leader there, cuing a struggle over who can better control the religious infrastructure of that kingdom. 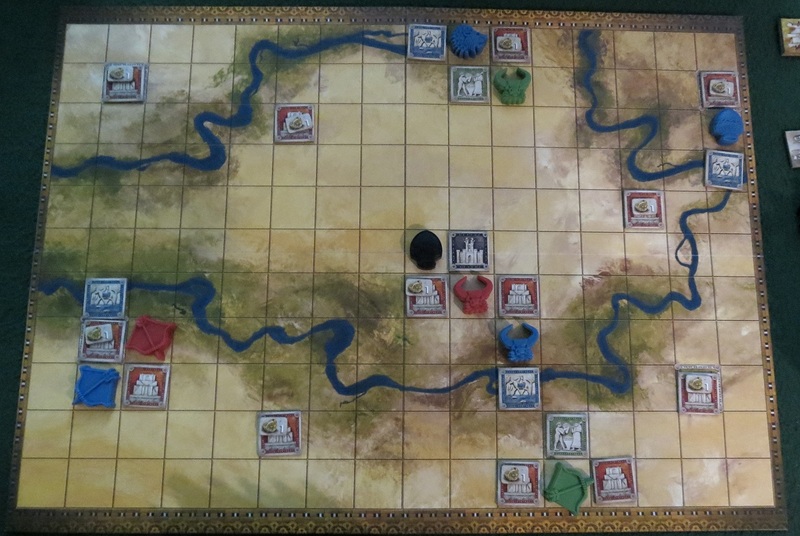 This is fought in the simplest of ways, counting which leader is adjacent to more temples (reds) and then letting players wager red tiles from their hand. It’s an elegant system with so much behind it, from careful placement of your temples and leaders to quietly stockpiling tiles to stage a coup or defend against an upstart. Civilizations growing into one another. But revolts are one thing. Then there are wars. As kingdoms become ever more powerful, huge chunks of tiles grown together, they reach their third act, a point where their eventual decline is more likely than not. They might face catastrophes, special limited tiles that can split a kingdom in two and salt the earth forevermore. Worse, they might be torn apart by wars. These happen when two kingdoms are united by the placement of a tile, except — “Whoops!” a player says, grinning impishly — now they’ve got leaders of the same color. Cue the drums. Like revolts, wars are simple affairs. Unlike revolts, they’re potentially devastating. Where a revolt is pitched as a religious conflict where a leader has the support of whichever priesthood they’ve ingratiated themselves with, here a leader has their entire nation at their back. Let’s say two kingdoms have been brought together, forcing two green leaders into conflict. They count up all the green tiles (called supporters) in their respective kingdoms, wager green tiles from their hands, and the highest number wins. Where this is different from revolts is that rather than just the leader being knocked off the board, all the supporters are too — often resulting in a kingdom being pockmarked with the scars of the war they just fought. Sometimes this even renders a swath of land undesirable, not worth the time it would take to rebuild. Often more devastating than the actual destruction, the victor gains spoils for everything removed, possibly bumping up one of their scores by an enormous margin. Wars, therefore, can be tremendously destructive acts, both to the layout of the board and the standing of a player. Now imagine what happens when a shrewd player places a tile in such a way that it unifies kingdoms with two or three matching leaders. Once-great kingdoms can disappear overnight, leaving only the barest remnants that they were ever there at all, and players who were once behind can be instantly propelled to supremacy. In my mind, all of these simple ideas represent two triumphs, two ways in which Tigris & Euphrates is one of the best games I’ve played this year, if not ever. First of all, I mentioned the three-act structure of the rise, consolidation, and decline of civilizations, but what’s so awesome about T&E is that the course of the game isn’t a single three-act structure. It’s a whole mess of them. Every single city-state, then every kingdom, then every unified empire stands to rise or fall. Many nations can go through this arc in a single game, a near-perfect representation of the turmoil of these ancient civilizations. Abstract? Sure. But not in any demeaning sense. 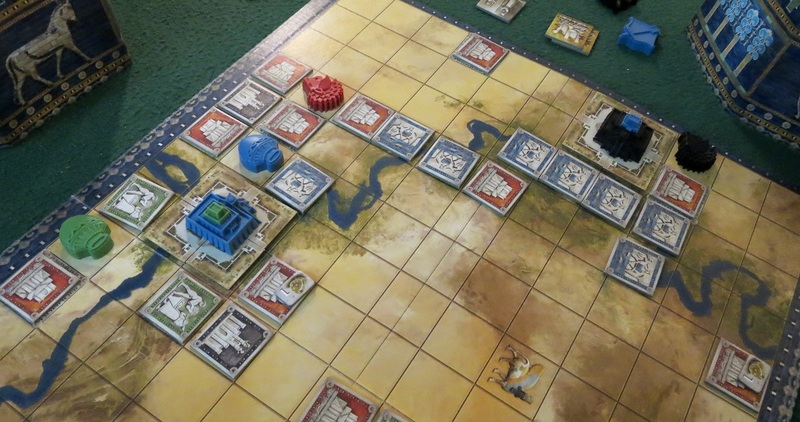 But even more crucial to the identity of Tigris & Euphrates is the fact that all of this adds up to an breathtakingly fantastic game, one where there is no shortage of compelling moves to be made with every single turn. I love that the game’s strategy forums are filled with people disagreeing with each other, because while a rule of thumb might seem like good advice one moment — say, “Don’t start a war unless you can profit from it” — that very same counsel will be dead wrong the instant you realize you can tear an opponent’s kingdom apart and give them a bunch of points they don’t need. It’s a shockingly malleable system, one that’s difficult to understand without actually diving in and playing it. And I sincerely hope you do. 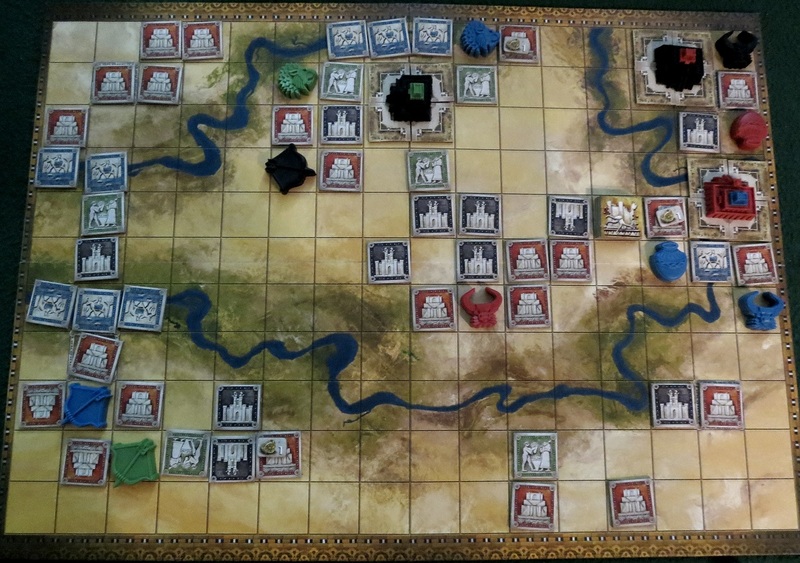 Posted on June 18, 2015, in Board Game and tagged Board Games, Fantasy Flight Games, Reiner Knizia, Tigris & Euphrates. Bookmark the permalink. 8 Comments. I’ve been eyeing this one for a long time, and your review just brought it back on my radar! Pingback: Samurai You Win, Samurai You Lose | SPACE-BIFF! Pingback: Best Week 2015, Rebaked! | SPACE-BIFF! Pingback: The Space-Biff! Space-Cast! Episode #1: Paranoid Cuneiform | SPACE-BIFF! Pingback: New Year, Old Year: 2015 Revisited | SPACE-BIFF! Pingback: An Old Game About the New Thing | SPACE-BIFF! Pingback: Still Not a River in Egypt | SPACE-BIFF!